Check out the freshly stocked ponds and volunteer to help kids learn to fish. Community fishing ponds in the Central Region are now being stocked by the DWR every week! This frequent stocking of rainbow trout will continue through May when water temperatures warm up. Then, in many of these ponds, we’ll start stocking catfish, too. Trout will continue to be stocked in cooler-temperature ponds as needed. Other regions across the state will have similar stocking schedules. Community fishing ponds are popular because they provide nice facilities, an abundance of fish and the opportunity to save money on gas. As a family, we spent more time at these ponds than at the larger reservoirs last year. My children love that we can grab a bite to eat within a minute or two after fishing. If the weather gets bad and we want to go home, we’re there within minutes. This young angler shows the catfish he caught at The Cove, a community fishing water in Herriman. One important thing to note is the two-fish limit at community fishing ponds. This provides more opportunities for the many anglers using these ponds. 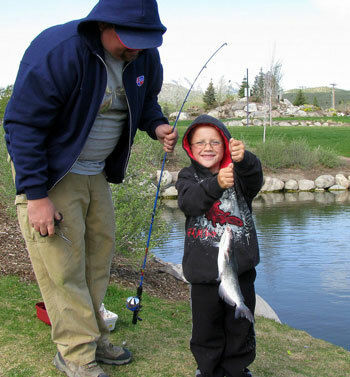 To learn more about the facilities and rules of community fisheries, visit the DWR Community Fishing webpage at http://wildlife.utah.gov/dwr/fishing/community-fisheries.html. Volunteering is another way to get outdoors and hang around the community fisheries. The Utah Community Fisheries Program in the Central Region is in need of volunteer fishing instructors for youth fishing clubs located at many of the community fishing waters. Our greatest needs are in the cities of Spanish Fork, Salem, Payson, Highland and Draper. You don’t need a background in fishing—just patience and kindness. You’d be working with kids from ages 6 to 13, in groups of five or less. The fishing classes/angling sessions are held two hours a week for six weeks. The courses take place in the late afternoon or early evening, depending on the city. Before angling begins on those evenings, the kids are instructed on basic angling skills such as safety, casting, equipment, ethics and biology. Volunteer instructors mentor children at the Community Fisheries Program in the Central Region. Make a difference in the lives of children and have a positive impact on your neighborhood by helping out in this enjoyable program. If you have any interest, please contact the Central Region Community Fisheries Coordinator, Tonya Kieffer, at 801-874-5705 or tonyakieffer@utah.gov. The weather’s warming up and the fish are stocked—it’s time to take advantage of these fisheries that are right in your backyard! wow I was just watching hooked on Utah and the fishing day in Payson pond. I am a father of a special needs daughter and to see how much fun this brought the kids made me have to say thank you to all the DWR but especially to Tanya Kieffer for putting it together. I am able to take my family fishing several times a year so we won’t be there but I wanted you to know how much it touched me that these special need kids get this service.